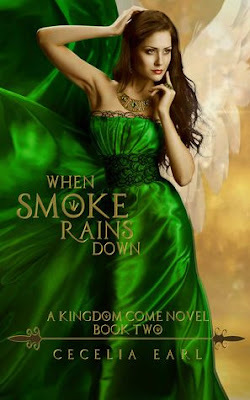 YA Bound Book Tours: Book Blitz Sign Up: When Smoke Rains Down (Kingdom Come #2) by Cecelia Earl! 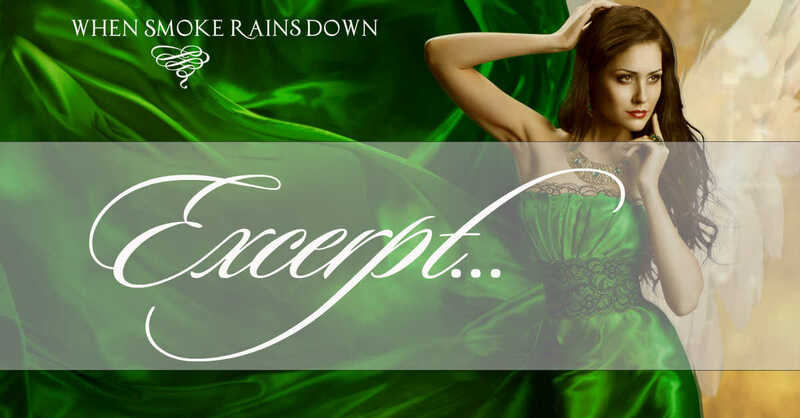 Book Blitz Sign Up: When Smoke Rains Down (Kingdom Come #2) by Cecelia Earl! In the aftermath of an explosion and Homecoming battle, Julia tries to form some semblance of a routine: work, study, visit her brother. Unable to confide in anyone about her double life of being both human and angel, and fearful she'll bring death and destruction to those she loves, she pulls away from her family and best friend. When demons once again start to show up at every turn, seemingly bringing about her brother's deepening depression, she demands her sword from Nicholas. Ever the stern Guardian Angel, he forbids her from using it. Isolated, she takes protecting her brother into her own hands. 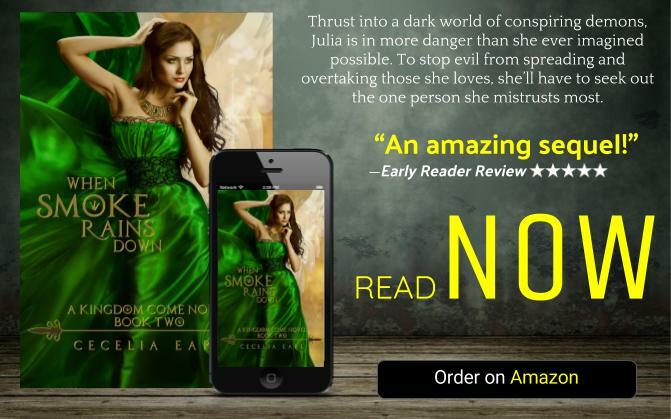 Thrust into a dark world of conspiring demons, Julia is in more danger than she ever imagined possible. To stop evil from spreading and overtaking those she loves, she’ll have to seek out the one person she mistrusts most. Enter a complex world where humans, demons, and angels collide, all battling to rule the Earth. For readers who enjoy young adult paranormal romance and dark fantasy. 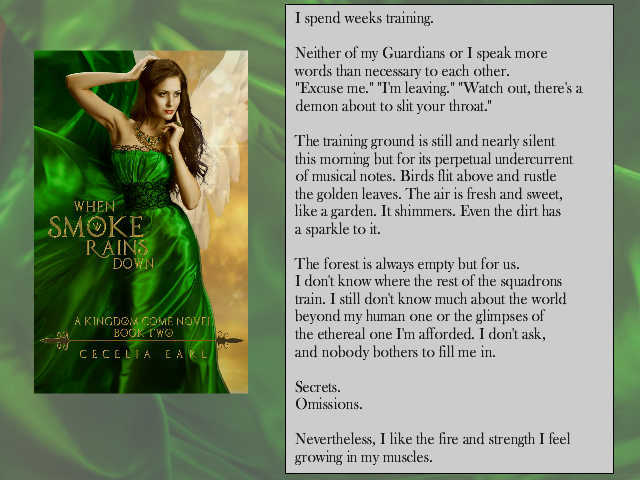 Fans of City of Bones, Hush Hush, Unearthly, Halo, and Hidden Wings will be captivated by this unique take on angels and demons. When Smoke Rains Down is Book Two in the Kingdom Come series. Book Three, the final installment, will be out Summer/Fall 2017. Nicholas is doing pull-ups from a low-hanging tree branch and doesn't acknowledge my arrival, so I follow suit. I squat and leap up to grab a branch. I'm getting stronger. He used to have to hoist me up to reach. I've also doubled the amount I can do before taking a break to do lunges and squats. "Sprints," he calls out when I've finished all the sets of arm and leg workouts. I race back and forth between two of the tallest tree trunks while he times me. It's apparent why I've been eating so much and obvious how much strength I've gained. Yet the stony expression on his face remains. This workout will make me ache for days. When finally I'm dripping with sweat and fatigued, he walks over to me. "Time for your lesson." Then he walks to the center of the clearing without waiting for a response. I allow myself two seconds to close my eyes and take a deep breath. I push out my wings and push up off the ground and glide over to him, lowering myself gently behind him. He turns and narrows his eyes. I put my wings away, proud of myself even if he's not. Flying had been rocky at best the first few times I'd tried it. I'd had no control and crashed into more than a few branches—and one bird. Poor thing. "Summon the bow and arrow we worked with last time," he orders. Bow, I think. Nothing happens. I reach my hand out into the air. Bow. A spear materializes in my closed fist. I growl. "It's all I ever get!" I let go of the spear and it disintegrates. "Bow," I yell. The spear is back in my fist. He sighs. "The spear is the lowest of the weapons. You have to work your way up." "I know this," I say through gritted teeth. "Spear, bow, rope, chains…" I don't bother to mention my sword. I've stopped asking for it. I try to calm down. Spear, I think. I get the spear I've pictured. One that's longer and narrower than the one I'd been conjuring up. I let it go and take a deep breath through my nose. Bow. The same short, thick spear materializes. Nicholas reaches into the air and pulls a bow and arrow from it with ease. He hands them to me. "Show me how to set the arrow and aim for the target." Nicholas had explained the reason the demons had overrun the hospital was most likely because of Noah, either because they're after him, or after something he has. He wants me to be ready the next time I'm faced with a hoard of demons on my own. He wants me to be able to get rid of demons from a distance by sending an arrow across a space, and though I can't summon the bow and arrow, my aim is pretty good. "Bullseye," I say after striking the center of the target three times in a row. "Pride will get you nowhere," he says, retrieving the arrows and returning them to me. Rather than aim the arrow at the target, I aim it at a knot in a tree and strike its center. "Julia, focus," he shouts, his voice stern and reprimanding. I can't stand the annoyance that flares to life in his eyes when I don't just do as he tells me. He's so bossy and controlling. More than once, I've nearly rammed him alongside his head with a metal object. After half an hour more, he relaxes. "Better. Now…"
He doesn't get a chance to finish his command, because Michael has entered the clearing. Twice before he's come to oversee either my progress or Nicholas's training technique. I'm not sure which. Nicholas is that much tenser when he's around, like he's trying to prove himself or something. And sure enough, he straightens and his shoulders go rigid. I guess he's been loosening up around me, because the difference in his personality is laughable. His face is all hard angles and his hands move at lightning speed. He won't look me in the eyes. I summon a spear and defend myself as Nicholas comes at me. We continue lunging at one another and defending jabs until Michael leaves with a nod and a "Good work." Nicholas gets up off the ground where he pinned me and brushes off his clothes. "Wouldn't it serve you better to cool it when he's here? Let me win and pin you or something?" He looks up from buttoning his overshirt. "No." "Well, I mean if you want to look like this almighty trainer, then wouldn't it benefit you to make it look like I'm able to fight well?" He strolls over to me where I'm still standing holding my weapon. "No. If you want to overpower me, then you have to earn it. Do it authentically. I don't play games to win. Or lose." I nod, chewing on my cheek, and then he adds, surprising me, "You are able to fight well." I'm almost touched by the compliment, so touched that I lunge forward, kick Nicholas's feet out from under him, and land on top of him. I push the long metal rod across his throat and pin him to the ground. He looks at me and whips me around, pinning me with the edge of a blade to my throat. "You made that too easy. Stay on the offensive and pay attention." He lays the dagger down in the dirt and holds himself above me with his palms on the ground, looking at me. His breath is on my face, and suddenly it's a gazillion times hotter and harder to breathe. He's so beautiful to look at when he's not scolding me and bossing me around. I realize how very much I needed to hear that compliment come from him, how very much I wanted to make him proud of me. He runs his tongue over his bottom lip. I take in a sharp breath. His eyes are on mine a moment longer before he pushes up off the ground and jumps to his feet. Once again, he strides off, leaving me to show myself out. "Sword," I demand of the air around me. A bow and arrow appear in my fists. "Gah!" I shout at the trees. I let the weapons drop into the shimmering dirt and stomp off through the trees. 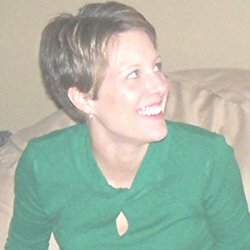 Book Blitz Sign Up: The Tower by Nicole Campbell! 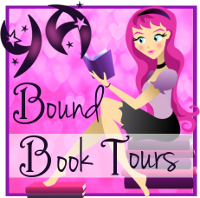 Book Blitz Sign Up: Amber Sky by Claire Warner!